Arianespace wrapped up another year of on-target launches with a dual-passenger mission today that orbited telecommunications satellites for Brazil and Japan – with both of these spacecraft produced by a U.S. satellite manufacturer. 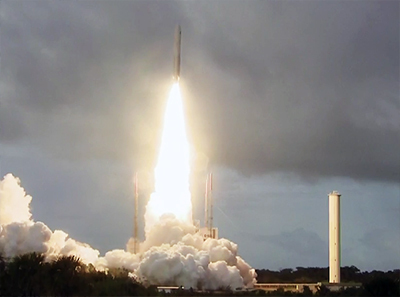 The seventh flight of Arianespace’s Ariane 5 heavy-lift vehicle in 2016 – and the company’s 11th overall this year with its launcher family – lofted the Star One D1 relay platform, to be operated by Brazil’s Embratel Star One; along with JCSAT-15 for utilization by Japanese operator SKY Perfect JSAT Corp.
1Both satellites carried on the latest Ariane 5 mission – designated VA234 in Arianespace’s launcher family numbering system – were produced in Palo Alto, California by Space Systems Loral (SSL) using the company’s SSL 1300 platform. The double mission marked the second time in 2016 that Arianespace orbited a pair of SSL-built satellites on the same Ariane 5. In addition to the use of heavy-lift Ariane 5s in orbiting telecommunications relay platforms built by SSL, four of the company-manufactured Earth observation satellites were lofted by Arianespace by its lightweight Vega in September for American operator Terra Bella. During Flight VA234, Ariane 5 delivered an estimated payload lift performance of 10,722 kg., deploying its two payloads in 43 minutes. Released first during the mission was Star One D1, which is now heading to a geostationary orbit position of 84 deg. West. The satellite will extend Embratel Star One’s operations in C-Band and bring new capacities in Ku-band for Latin America and Ka-band for Brazil, complementing the service provided by Embratel Star One’s Brasilsat B4 satellite – launched by Arianespace in 1994. The second passenger’s deployment during Flight VA234 put JCSAT-15 on its way to a geostationary orbit location of 110 deg. East, where it will relay the multi-channel pay TV service SKY PerfecTV! across Japan, as well as provide data transfer communications and maritime/aviation applications for the Oceania and Indian Ocean regions. JCSAT-15 is intended to replace the N-SAT-110 satellite, which Arianespace orbited in 2000.